Book Your Lake Salmon Fishing Trip Today! Vertical jigging fishing for King Salmon (Chinook) and Coho Salmon on Lake Michigan - Grand Traverse Bays and Platte Bay - is exciting and fun! Our boats are equipped with the best Humminbird electronics for targeting Michigan salmon, and our Captains and Guides are vertical jigging experts. We have helped to popularize this technique, and our years of experience shows. Vertical jigging is a light-tackle, hands-on technique that allows you to feel the bite, see and hear your line peeling off the spool during a salmon's lightning-fast run, and experience the excitement of working to reel in king salmon and coho salmon. This is an absolutely addictive way to target salmon, and is also a very productive way to garner explosive bites. 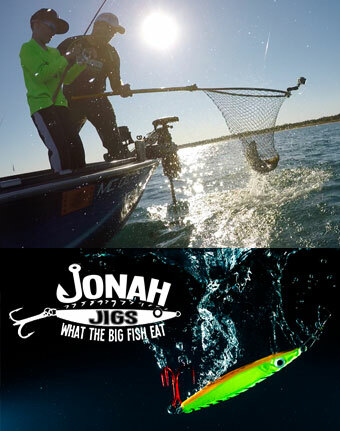 They do bite jigs, and the proof lies with our hours of underwater video as well as our years of happy customers. More than strong and feisty fighters - salmon are absolutely delicious! At the end of your trip, your Captain or Guide would be happy to assist you with filleting your day's catch so that you can enjoy sharing great dining, and stories about your fishing trip, with family and friends. Each year, thousands of enormous salmon are present in Lake Michigan, and mid- to late-summer and fall are the best seasons to target them. Mature salmon move closer to shore before making their run into the same Michigan tributary rivers in which they hatched. As their numbers increase nearer to shore in the early fall, large numbers of salmon can be found cruising in Michigan's coastal waters entering many ports, bays and connecting lakes along the coast. Grand Traverse Bays and Platte Bays are two areas where Sport Fish Michigan targets salmon as they are staging, getting ready to run up their natal rivers. It is the areas where the salmon will congregate in these staging grounds that produce the best for the vertical jigging technique. 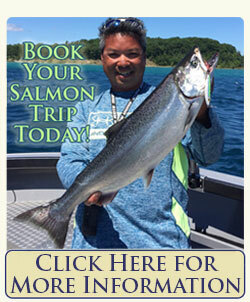 Sport Fish Michigan's Captains and Guides know how, when, and where to find salmon. Their expertise, coupled with the state-of-the-art Humminbird electronics and Minn Kota trolling motors aboard our fleet of charter fishing boats, take all the guesswork out of salmon fishing - ensuring that you'll have a fun day vertical jigging for salmon! 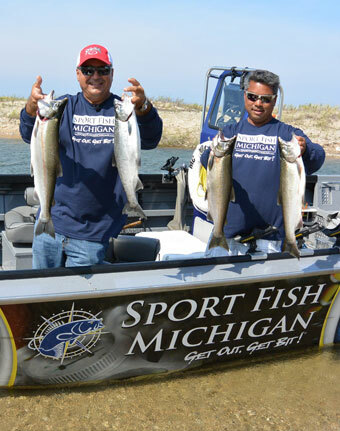 Let one of Sport Fish Michigan's experienced Captains be your guide for this productive and action-packed way to target Lake Michigan salmon.